Pardee’s paintings and collages employ notes of color – blazing oranges set against limpid greens and deep, placid blues – to vitalize the presence of trees, benches and buildings within all-over, pulsing, abstracted compositions. But even as his colors shift with primal energy, he tests spatial possibilities with a more cerebral array of tools: circulating lines that position patches of color around a running track or fountain; inserted fragments of photographs contrasting “real” spaces with painted ones; appended color scales that echo the relationships of hues within the image, where they may be disguised by the very act of representation. Several of the larger works incorporate multiple scenes in grid-like arrays, so that separate, charged spaces add up as shimmering tapestries. These satisfyingly combine a largesse of movement with a concision of detail. 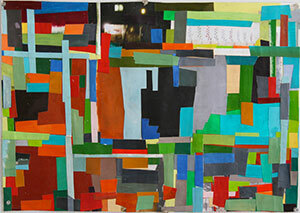 Interestingly, despite their relatively ungainly technique, the collages often surpass the compositional energy of the paintings, using stronger contrasts of color and more obtuse oppositions of the vertical and horizontal. The collage titled “Black Abstraction” (2015) is especially vivid, working broad rhythms against smaller ones within a restlessly churning design. 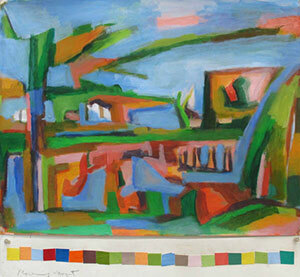 When artists share their process, they usually call our attention to particularly evocative materials and techniques. Pardee, however, focuses on a different kind of process, one that’s arguably even more fundamental to visual experience: the challenges of seeing and reconstructing. His paintings and collages eloquently remind us that while all art is artifice, it’s far more than a system of signs; it’s rooted in primal, optical experience, and it convinces according to its own internal rhythms.